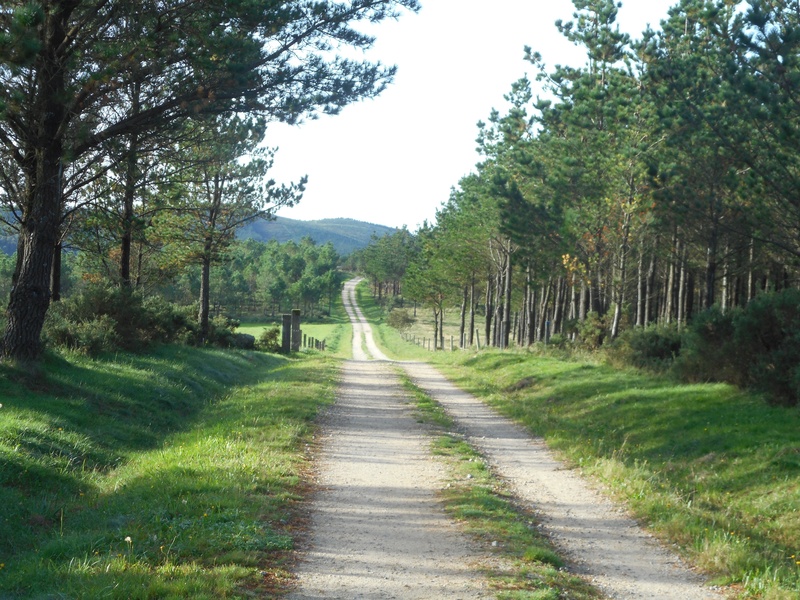 A pilgrimage along the Camino de Santiago – the Way of St. James. 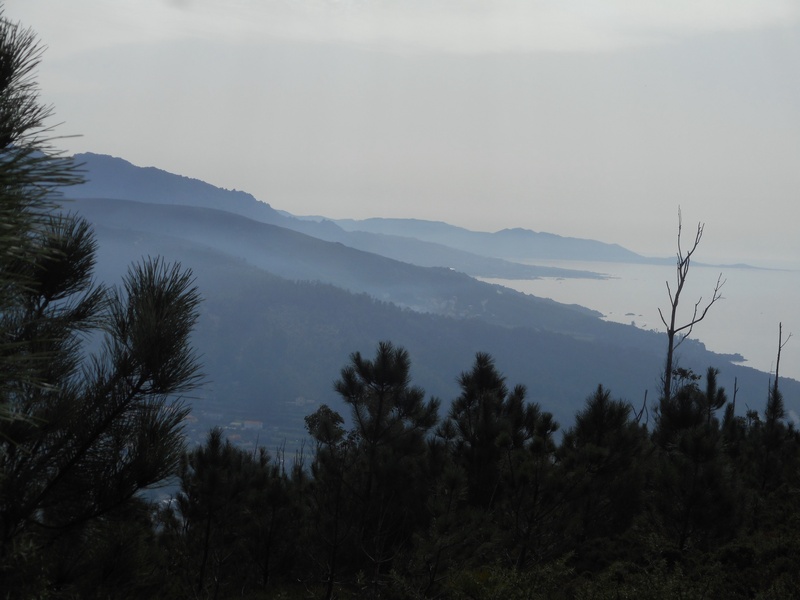 The walk to Finisterre – the end of the earth – is seen by many as icing on the cake of the Camino. It is definitely a way less travelled. Only about 10% of the people who complete the Camino continue on to Finisterre. But, that is part of the charm of this optional extension to the Camino. 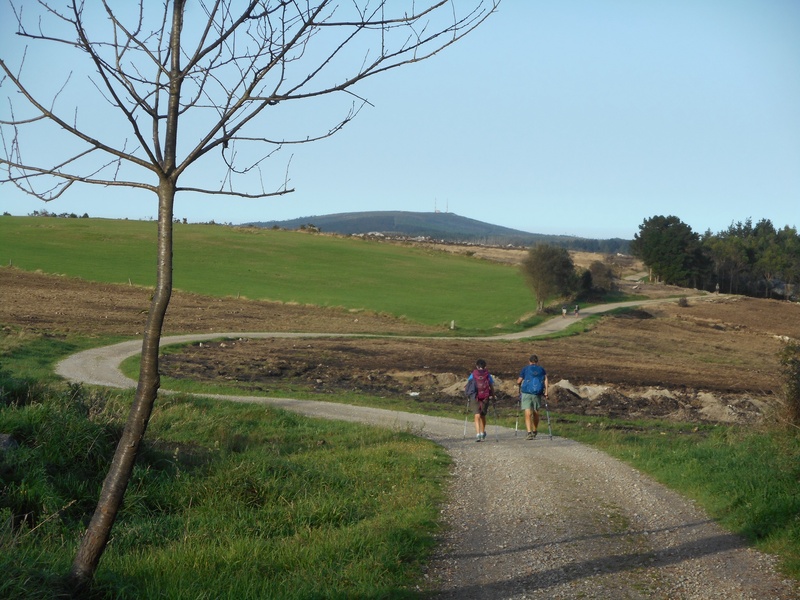 Many walk this route, which is about 93 kilometers long, as a reward for completing the Camino or as a way to wind down after the intensity of the Camino. 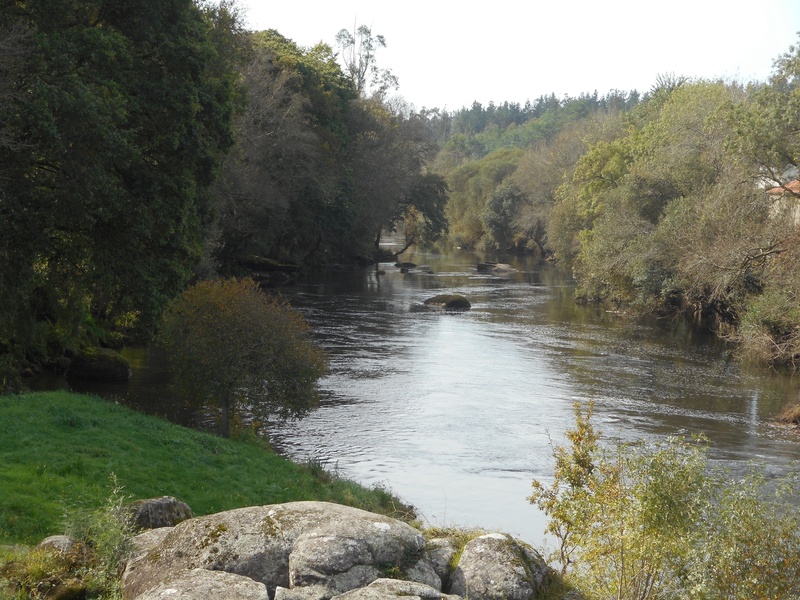 The route is beautiful as it crosses some remote yet lovely portions of Galicia and it does offer a termination at the Atlantic Ocean. In any case, Clint and I had planned to walk this route and we are now two days into it, with one day remaining before our arrival in Finisterre. We left Santiago yesterday morning (Monday) under clear skies, resuming the Camino from the plaza in front of the cathedral. We ran into a couple of our Camino friends again (Ken from Manchester/Liverpool and Elke from Austria) at the plaza and said our final goodbyes. 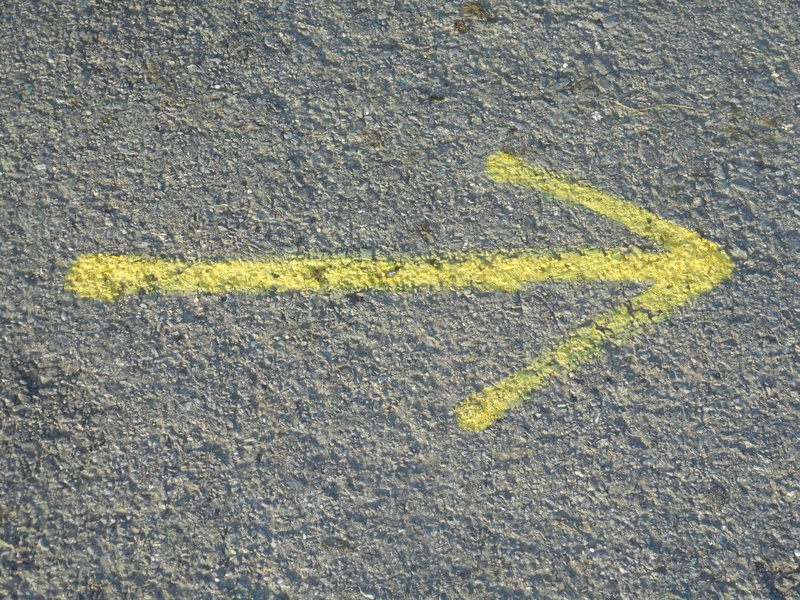 We then followed the directional arrows through a city park and on out of the city. Most of the route for the day was wooded and provided a lot of shade, which was very welcome as the sun rose and the temperature followed suit. 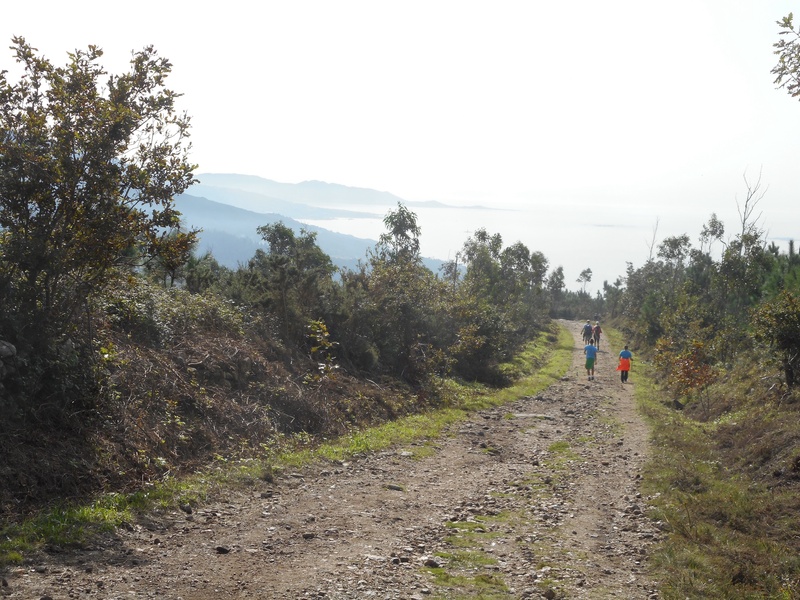 The biggest challenge for the day was the ascent of Mar do Ovellas. This mountain wasn’t so high (only 275 meters/825 feet) but the steepness of the ascent, only 2 kilometers in length, made it a physically demanding sector. We were greatly relieved once we reached the top. But, as with much on the Camino, the views were spectacular and, with good weather, the hike was satisfying. We were told that last week it was especially wet and windy in these very hills. We saw many tree limbs down and across the path and gave thanks that the bad weather was gone. 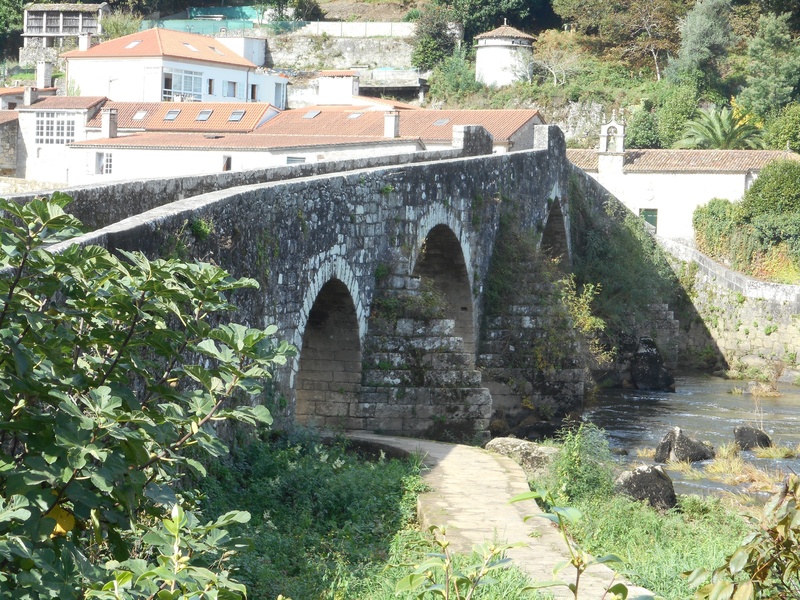 One highlight of the day was walking across the Ponte Maceira – a magnificent medieval bridge over the rio Tambre. The adjacent medieval town is very well-preserved and retains the ambience of its historic past. About mid-afternoon we arrived in the more modern town of Negreira and checked into a private albergue for the evening. As a simple explanation, there are basically three types of albergues available for pilgrims. There are municipal albergues run by local municipalities or states, there are religious-affiliated albergues run by parishes, monasteries, or convents, and there are private albergues run by individuals or pilgrim associations. Any town on the Camino might have albergues of any or all of these types. All of them offer the same basic amenities (bunk beds, bathrooms, showers, laundry rooms, kitchens, and often WiFi) and will charge between 5 and 10 euros for the night. Some also offer food and other services, but these are not typical offerings. Our experience was that most of them are reliable and, even though they are pretty basic, the price is right and they offer a good nights rest. This morning we cheated a little. The planned route for the day was over 30 kilometers in length. We have discovered that 20 kilometers is a good daily distance for us. Anything in excess of that becomes oppressive and abusive to our old bodies. So, since we had already completed the Camino without cheating, and since we only had a few days before our return to the States, we gave in and took a taxi to the midpoint city of Olveiroa and began our day’s walk from there. Once the day’s hike began, we crossed a long stretch (over 12 kilometers) of high moors that our guidebook says is “one of the longest and most isolated stages on the whole Camino.” There were no services or food/water on this stretch, but again the scenery was glorious and the pathway was fairly level and in good condition. At the end of the day’s hike we were additionally rewarded with our first views of the Atlantic Ocean and Cape Finisterre. We traversed a steep descent to sea level and entered the seaside town of Cee where we have checked into another private albergue for the night. Tomorrow we will continue the short remaining distance into Finisterre. 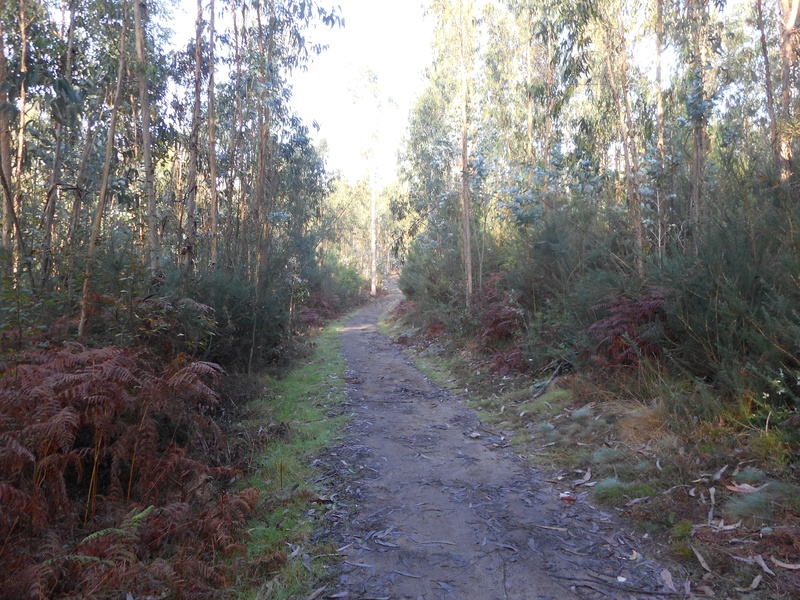 One nice thing we have noticed on our hike to Finisterre is that we have totally lost the tourist hikers and those who hike sin mochillas (without backpacks.) All the hikers we met today were “authentic” pilgrims – most of whom had started weeks ago in St. Jean Pied de Port and were carrying their own packs. It was a welcome change and it felt good to be among those who had taken the pilgrimage seriously enough to hike in an authentic manner.